Nothing says scared like being in a claustrophobic setting with no way of calling for help. And with San Diego Comic-Con upon us, Warner Brothers is giving us our first footage from Godzilla: King of the Monsters. Star Millie Bobby Brown has revealed some teaser footage of her character calling for help. But what she gets on the other line might shock her. Check out the video below. Brown first posted the footage on her personal Instagram account. Though it may be too early to show who is going to be crowned king, the chilling tone tells us that this won’t be just another Kaiju movie. But this is just a tiny preview of what is to come. We can expect to see the entire thing and more when the Warner Bros. panel rolls around this weekend. But the one recurring theme in all of this is Monarch, the secret organization that has been tied closely to the Kaijus or MUTOs (Massive Unidentified Terrestrial Organisms). But given Brown’s current location, it looks like she is in an abandoned station. So what’s up and how did Brown get in there? And what is with those noises? The whole situation reminds me of an episode of LOST. 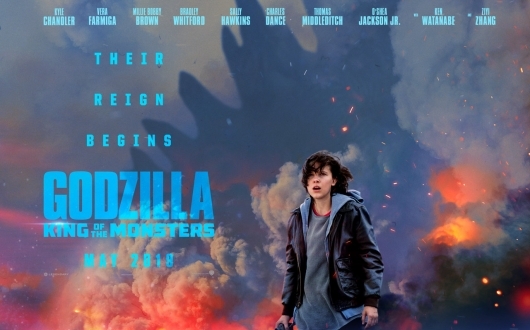 But we still don’t know much about the film, other than the fact that there will be a variety of monsters fighting to be crowned king of the monsters. It should be exciting to see what kind of mayhem and destruction comes from this. Let’s hope we get a better look at some of the new contenders. Because that first teaser image isn’t enough. The film also stars Bradley Whitford, Thomas Middleditch, Charles Dance, O’Shea Jackson Jr., Aisha Hinds, Zhang Ziyi, and Anthony Ramos. Ken Watanabe and Sally Hawkins also return to reprise their roles from 2014’s Godzilla. Vera Farmiga‘s character is a described as a “DJ for the monsters” and Kyle Chandler will play her husband.